Debt levels are rising. Not only at the government level, but the personal level too. American consumers recently hit an alarming milestone. Even though the economy is growing, the labor market is supposedly strong, cash-strapped Americans are taking on more debt than ever. Americans now have $1.021 trillion in outstanding revolving credit debt (mostly credit cards), according to the latest report by the Federal Reserve. That is the largest amount of debt in history. Meanwhile, the U.S. government sailed past the $20 trillion mark with our federal debt. Right now, policymakers in Washington D.C. are busy proposing legislation that would remove the debt ceiling limit for Congress. In essence, that would give Congress an ultimate blank check, or a credit card with no credit limit. Even if Americans or the government never pay off their debt, they still have to pay the interest on that debt each month. 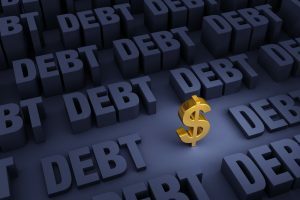 Are You Prepared For Tomorrow's Debt Problem? Even though the Federal Reserve has edged interest rates slightly higher over the past couple of years, they are still very low. Low rates benefit anyone who is paying off debt. But, once interest rates go higher, that means interest on your debt goes higher too. Why does this matter? At some points interest rates will go up, and perhaps significantly. Higher rates mean a larger portion of the government's outlays must go toward debt repayment. That means less for the Social Security and Medicare payments, military, roads, education, and whatever other services the government spends money on. That compares to a "normal" rate of around 4%. Looking at the U.S. 10-year Treasury yield (the rate most mortgages are based off), before the 2008 global financial crisis, yields were much higher. In June 2007, the 10-year yield stood at 5.31%. In January 2000, the 10-year yield stood at 6.82%. In November 1994 a high was seen at 8.16%. Once government debt levels climb above 90% —that, in and of itself, weighs on economic growth prospects, according to Carmen Reinhart, a professor at Harvard Kennedy School and Kenneth Rogoff, an economist at Harvard University. The U.S. has already blown past that mark. Debt to GDP ratio stands at 103.1 as of the second quarter, according to the St. Louis Fed. The U.S. (and other major advanced economies) are already struggling with slow growth for a multitude of reasons. The debt only compounds the problem. Gold can't be devalued like paper currency. The Fed can't "print" more gold any time it's looking to juice up the economy. Gold is a true, time-honored store of value recognized in every country around the world. There's many reasons to own gold, and high and rising debt levels may just be another one. What do you think about the debt problem? We'd like to hear your thoughts.